Chips, cracks, gaps, or discoloration can affect the beauty and symmetry of your smile. Fortunately, most of these cosmetic concerns can be addressed with non-surgical, minimally invasive procedures offered at our two offices in Scarborough, ON, and Toronto. Dr. Arlene Caringal performs various cosmetic dentistry treatments designed to address your unique aesthetic concerns. Our options range from orthodontic treatment to teeth whitening. If you are unsure which procedure is right for you, our team can evaluate your smile during your one-on-one consultation. Do You Have a Crooked, Gapped, or Crowded Smile? If you are unhappy with your smile due to misalignment, you should consider orthodontic treatment first. In addition to improving the look of your smile, straighter teeth are easier to brush and floss and can reduce your risk of tooth decay. Traditional braces are a proven and effective way of correcting nearly all types of misalignment. As an Invisalign provider, Dr. Caringal can help you reach a straighter smile without the fuss and hassle of braces. Invisalign is a discreet orthodontic option that allows most patients to reach a straighter smile in just 12 to 18 months. For patients who have previously had braces and need a minor adjustment, we typically recommend the Dentsply Sirona MTM Clear Aligner. This treatment can noticeably straighten your smile in as little as one to three weeks. Do You Have Large Teeth or Small Gums? Whether you were born with small gums or have them as a result of gum recession, Dr. Caringal can restore balance and symmetry to your smile with a gum graft. During the procedure, she will take gum tissue from another location in your mouth and suture it in places where you have tissue loss. In addition to helping your smile look more symmetrical, a gum graft can reduce sensitivity in your tooth roots. Dr. Caringal combines science, artistry, and a personalized approach to dentistry to help her patients achieve the smiles they once had or always wanted. Do You Have Cavities or Old Fillings? When left untreated, tooth decay can cause sensitivity, pain, and even tooth loss. If your cavity was previously treated with a metal filling, the silver-colored filling often stands out against your healthy surrounding teeth and can leave you embarrassed to show your smile. Tooth-colored fillings are a more aesthetic alternative to traditional metal fillings. They are made from composite resin that is closely matched to the color of your surrounding teeth. In addition to improving the health of a decayed tooth, they blend in seamlessly with your smile. Porcelain veneers are placed directly over the front of your teeth to conceal cracks or other minor imperfections. Do You Have Yellow, Discolored Teeth? Stained, yellow, or discolored teeth can make your smile look unhealthy and decrease your self-confidence. One of the most popular cosmetic dentistry treatments is teeth whitening because it is safe, cost-effective, and minimally invasive. Dr. Caringal offers both in-office and take-home whitening treatments for patients who prefer to brighten their smile on their own schedule. Because they are professionally supervised, professional whitening treatments contain a stronger concentration of peroxide and can help you achieve your desired results faster and more effectively than store-bought products. Do You Have Chips, Cracks, or Misshapen Teeth? Lightly damaged or disproportionately sized teeth can interrupt the symmetry and beauty of your smile. Porcelain veneers are custom-made shells that cover cosmetic imperfections including chips, minor gaps, and intrinsic stains. They are carefully designed to match the color and texture of your natural teeth and show excellent, lifelike results. Are You Unhappy with Many Aspects of Your Smile? If you have a multitude of cosmetic concerns, you might not know where to start improving your smile. A smile makeover is a series of cosmetic procedures combined into a personalized plan tailored to your individual concerns. Dr. Caringal provides extensive one-on-one consultation time and allows you to try on your proposed treatment with “wax-ups” so that you feel confident and excited about your potential results. 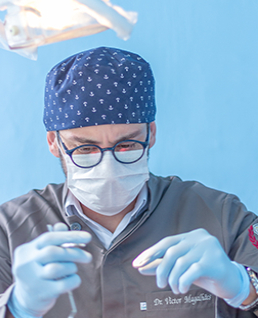 Dr. Caringal has received extensive cosmetic dentistry training from various organizations including the Kois Center and the Las Vegas Institute for Advanced Anterior Esthetic. She combines science, artistry, and a personalized approach to dentistry to help her patients achieve the smiles they once had or always wanted. To schedule your cosmetic dentistry consultation, call our office (416) 646-1737 or request a consultation online.